This is part of a sponsored campaign. However, all opinions are my own. My girls and I are huge fans of all of the X-Men movies. It's funny because first we were waiting and waiting for X-Men Days Of Future Past to release, and now that it's out, we haven't been able to go see it as a family because everyone is working on different schedules. This weekend I think we will finally get the opportunity to go and watch it and see all of our favorite characters. I really can't wait because we have been waiting for what feels like forever for this movie to come out and I am stoked we will get to see all our favorites in one movie. 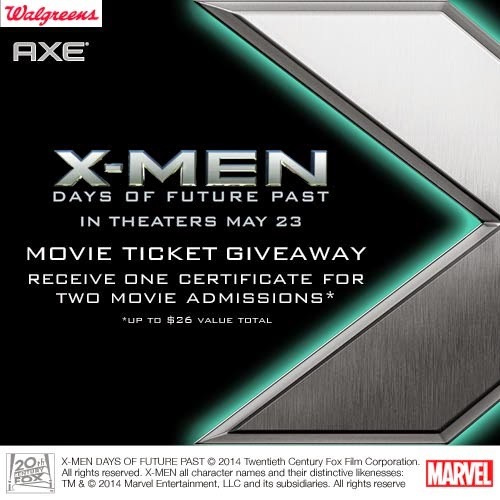 If you watched the movie and loved it or are still waiting to see it, you can visit a Walgreens near you for an exclusive X-Men: Days of Future Past Axe® gift pack with a FREE movie poster inside! Axe® is a favorite of all my nephews and my son in law and I know they are going to love getting the specially marked X-Men packages. I also know which little boy (Angel) is going to love the X-Men poster! He is a huge fan of Wolverine. Enter your zip code into the store locator below to find a Walgreens near you. Because not everyone, like us, has gotten the opportunity to go and see X-Men X-Men Days Of Future Past we are giving away some movie tickets! Or maybe you already saw it and would love to see it again?? Three winners will each win two tickets! Just fill out the RC form below, giveaway runs until Friday at midnight. Good luck!